Mgr Li Shan, who was ordained the capital’s bishop with the approval of the Holy See, now apparently backs an independent Church. This is dividing the faithful and causing embarrassment to the Vatican. For more than a year now the Communist Party has been on the offensive to get official bishops to tow its line. But for Cardinal Zen the time of compromise is past. Rome (AsiaNews) – Just over a year after Beijing Catholics got a new bishop, they are divided over his episcopate as more and more accuse him of betraying the Holy See. Mgr Joseph Li Shan, 44, was ordained on 21 September 2007 with papal approval. But after more than year in office his attitude towards the Vatican seems to have changed. For many Catholics the clergyman who replaced Michael Fu Tieshan, the patriotic bishop who died a year earlier, is getting too cozy with the Chinese Catholic Patriotic Association (CCPA), and moving too far away from the Holy See. The faithful have been taken aback by his way of doing things, by speeches that seem to increasingly parrot the party line of the CCPA, an organisation that is openly committed to building a Catholic Church independent of Rome. Some of his speeches are particularly revealing. More disconcerting though was Mgr Li Shan’s defence of his predecessor, Bishop Fu Tieshan, who began a “glorious tradition” that sought to inspire Beijing faithful to “love the fatherland” and “love the Church”. The slogan “love the fatherland, love the Church” comes in fact from the CCPA and its used by a bishop underscores the Church’s subordination to the Communist Party. On Christmas Eve last year Mgr Li Shan again delivered a similar speech when at 7 pm he met Ye Xiaowen, director of the State Administration of Religious Affairs; Zhou Ning, director of the Second Section of the United Front; Tong Genzhu, deputy minister of the Central Department of the United Front; and many others, including Beijing Deputy Mayor Niu Youcheng. On this occasion the faithful were again shaken by what Mgr Li Shan had to say. Expecting a prelate who would end Bishop Fu Tieshan’s subservience to the party and his steadfast refusal to seek reconciliation with the Holy See, they got instead someone who thanked the Chinese government for its help and support to the Church and its activities. In this address he said that the Church would continue to uphold the notion of “love the fatherland, love the Church”, and pursue the goals of “independence and self-government” (from the Holy See), that would make the Catholic Church a model for building a harmonious society. In every one of his speeches and statements, the tone and slogans used by the bishop reflect the style used by the Communist Party during its most radical period, that of the Cultural Revolution. No wonder then that the faithful would be surprised and ask themselves how their pastor could turn so quickly into “a Red Guard” and show such a servile disposition towards the CCPA and the people in power, exceeding in many ways even his predecessor. Mgr Li Shan was known as a good priest, simple, perhaps not too broad-minded but faithful to the Pope, able of arousing passion in the young and particularly open to the underground Church. His speeches against “foreign states” and the underground Church turned everything on its head, representing a total shift in his way of thinking. According to information that reached AsiaNews, Mgr Li Shan did not write his speech, which was penned instead by Shi Hongxi, general secretary of the Beijing chapter of the CCPA, well-known for his radical views. Other sources say the bishop got the speech shortly before he was supposed to deliver it without knowing its content. However, when the same slogans pop up in three different speeches, it matters not whether the bishop agrees or disagrees with them; what counts is the fact that he is under the thumb of CCPA. This, in turn, raises another question. According to other information that has reached AsiaNews, Mgr Li Shan said he was sorry for what he did, claiming that his behaviour was the result of the great pressure put upon him. In fact, the papal letter and the renewed unity among Chinese bishops have led the United Front and various CCPAs to launch a series of initiatives, beginning more than a year ago, to enforce obedience among official Chinese bishops. Both the United Front and the CCPA continue to summon bishops to meetings, force them to participate in conferences, round-tables, studies, political sessions, all of which undermines their pastoral work. Bishops have no opportunity to meet among themselves. Instead, they end up spending a lifetime of solitude, at the mercy of CCPA’s secretaries, shuffling between meetings during which they are kept under the control and subjected to brainwashing by the United Front and the State Administration for Religious Affairs. In order to strengthen unity among bishops and put a stop to CCPA influence, the Vatican sent out a letter, dated 22 April 2008, to all Chinese bishops in communion with Rome. Signed by the Vatican Secretary of State Card Tarcisio Bertone, the letter took months to reach the 90 or so bishops in the official and underground Church, some of whom only got it in December 2008. In it Cardinal Bertone stressed the “fundamental principles of Catholic teaching” and reminded bishops of the value of communion between themselves and the Pontiff and among themselves. For this reason he asked every prelate on behalf of the Pontiff to “discharge courageously your office of Shepherd,” promote the Catholic nature of the Church, and obtain greater freedom of activity through direct and respectful dialogue with civic authorities. The cardinal's letter also called on the bishops “to act together”, to demand the right to meet as a group, to freely discuss issues that matter to them, without any outside interference. It ended asking the bishops to find a "correct attitude to adopt with regard to those entities to which reference is made in (section) 7 of the Papal document,” i.e. entities like the CCPA with its idea of an independent and self-governing Church. Such a document is important because it suggests for the first time that official and underground bishops should meet, but avoids saying that the two groups should have the same attitude towards the CCPA and the committees representing Catholics. Likewise the papal letter had noted that such entities are contrary to Catholic doctrine but did not ask official bishops to resign from them. Some underground bishops have said that a more decisive stance on the part of the Holy See would be more effective. So far official bishops have tried to resist CCPA pressure, whilst some underground bishops have tried to get government recognition without joining the CCPA. In both cases they have had little success. Their failure demonstrates the central role played by the CCPA in the government’s religious policies. This problem is even more urgent because national meetings are being prepared to pick the new chairman of the CCPA and the head of Bishops’ Conference of the Catholic Church in China or BCCCC (the Catholic Bishops’ Conference that is not recognised by the Holy See). The election to these two posts is expected to take place at an upcoming National Congress of Catholic Representatives. Although no date has been set, the selection should not be too far into the future since both posts are vacant. Beijing’s Bishop Michael Fu Tieshan of Beijing left the CCPA chairmanship empty when he died in 2007 (he had been elected in 1998). 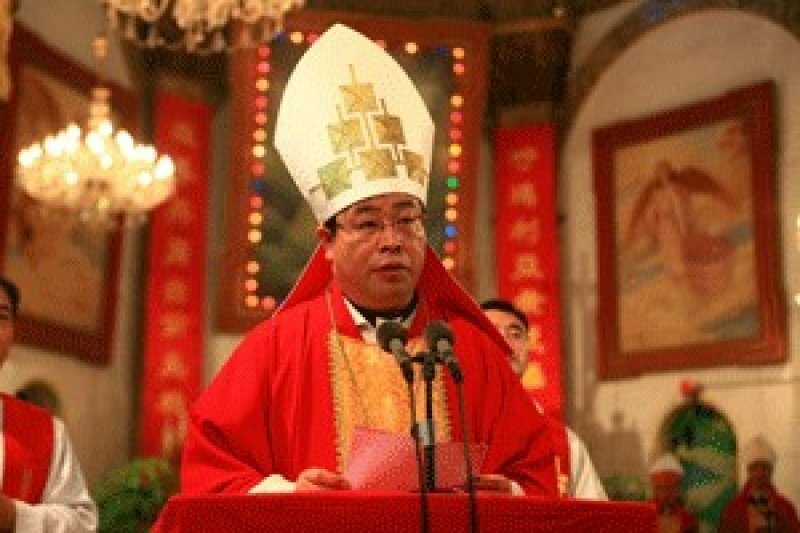 Bishop Joseph Liu Yuanren of Nanjing headed the BCCCC from 1998 until his death in 2005. Imposing controls on bishops, forcing them to attend conferences and political sessions, celebrating the 50th anniversary of self-election and self-ordination of Chinese bishops under the sponsorship of the United Front and the CCPA are part of a broader strategy designed to break the will of official bishops and get them to submit to traditional forms of control. Many Catholics, both official and underground, are concerned that without clear and specific guidelines from the Holy See, official bishops will be forced by events and individual interpretations of the papal letter into making compromises. More than a year after the release of the Pontiff’s letter to Chinese Catholics AsiaNews conducted a survey in the last few months among Chinese bishops as to their attitudes towards Benedict XVI’s guidelines. Some answers are startling. On the one hand, some bishops praise the Letter and the Pontiff’s teachings, which push towards unity with him and among themselves. On the other however, they do not seem touched at all by the fact that the document describes CCPA’s ideals and policies as ‘incompatible” with Catholic doctrine. Other Catholics, especially in Beijing, accuse the bishops of being power hungry, motivated by greed. This is why they accept compromises. Many bishops and believers are afraid that given this situation of weakness 2009 might see a new series of unlawful ordinations, designed to build up a core of “patriotic” prelates, all obedient to the Communist Party. Out of this ambiguous and confused situation the voice of Card Joseph Zen of Hong Kong has risen to wipe the slate clean of ambiguities, asking bishops and priests in the official Church to be more courageous and resist making compromises with the Communist regime. We have already mentioned his intervention elsewhere but it is worth repeating. In an article published last 4 January in the diocesan weekly Kung Kao Po (later reprinted in English by the Sunday Examiner), the cardinal urged Chinese bishops and priests to follow the example of Saint Stephen, the first martyr, and always resist the government when it says or does something that is contrary to the faith. In his article “Inspiration from St. Stephen’s Martyrdom,” Cardinal Zen vetted developments in China’s Catholic Church over the last two years, noting the number of unlawful (not Vatican approved) ordinations in 2006, including, regrettably, ten bishops approved by the Vatican, who submitted to the process out of fear or simply tricked into it. With the regard to this last point the cardinal strongly criticised certain interpretations given to the papal letter, especially one by CICM missionary Jerome Heyndrickx in which the latter said that it was time for the underground Church to pack it in and for bishops join in the official Church. On the contrary, the cardinal insisted that the Pope admired “their faithfulness without giving in to compromises” and encouraged them to “persevere,” as Benedict XVI showed in his Angelus address on the Feast day of Saint Stephen, 2006. For the bishop of Hong Kong, there is nothing to celebrate since the system of “self-election” and ‘self-ordination” is the work of 1950s extreme leftwing radicals who saw the Pope as an agent of imperialism. Now this attitude has been overtaken by time, by 30 years during which China saw economic reforms undermine this radical worldview. All the hoopla over CCPA’s 50th anniversary, its “elections” and its “ordinations” is in the prelate’s view a clear sign that the elections for the CCPA’s new chairman and for the new president of the Chinese Bishops Council are fast approaching. In the aforementioned article Cardinal Zen said that some members of the Chinese Church are praising compromises and ambiguity. 1. In typical Maoist fashion “colonial” refers to submissiveness to the Vatican. 2. The speech (in Chinese) was available until recently on the Beijing diocese website. Mgr Li Shan’s address on 19 December on the occasion of the 50th anniversary of the first elections and ordinations independent of the Holy See was available on the same website as well. It too was recently removed. 3. Cf “The Pope prepares a letter to China’s Catholics,” in AsiaNews, 20 January 2007, accessed on 28 January 2009. 4. Cf “Letter of the Holy Father Pope Benedict XVI to the Bishops, Priests, Consecrated Persons and Lay Faithful of the Catholic Church in the People's Republic Of China,” in Papal Archive, Benedict XVI, Letters 2007 (see footnote 36 on CCPA) accessed on 28 January 2009. 5. The definition was used at the time of Mgr Li Shan’s ordination and has been used again in his famous speeches. 6. Cf “Carta 08: cambiare la Cina col rispetto dei diritti umani,” pp. 28-32, in AsiaNews (paper edition in Italian), January 2009. 7. Cf Wang Zhicheng, “Beijing, Vatican must break with Taiwan and not interfere in domestic affairs,” in AsiaNews, 20 December 2008, accessed on 28 January 2009.